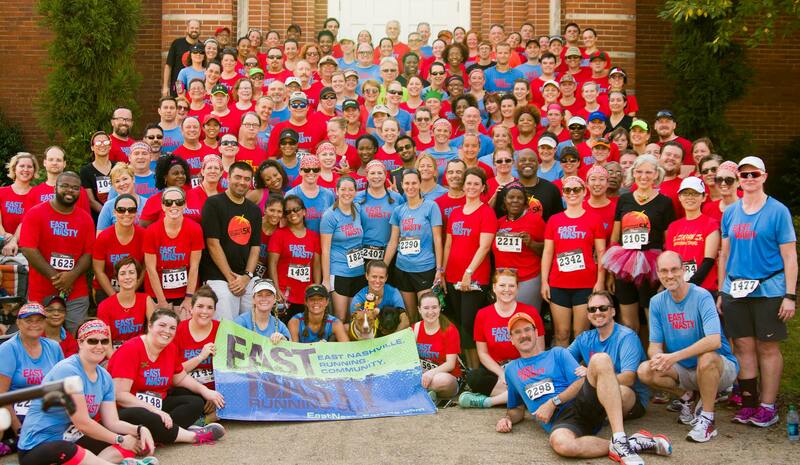 For 11 years East Nasty has brought a vibrant charm to Nashville’s running community. With a 6 AM and 6 PM run meeting every Wednesday in East Nashville at 11th and Holly, the group attracts well over 100 runners. East Nasty isn’t just a running group, it is a 501(c)3 non-profit organization which is dedicated to the East Nashville neighborhood. They offer many different routes from their meeting place near Bongo Java East, and the routes will differ in distances and follow a 12 week schedule during the year. Many of the routes are challenging and fun, but the crowning jewel is The Nasty which toughest run and features (you guessed it) “The Nasty,” which is a monstrous hill right after mile 3. After having run The Nasty you are graced with a sticker to attach to your car/water bottle/forehead and if you should choose to run The Nasty again (once that route comes back in the rotation) you are able to get smaller stickers that continue to herald your accomplishment or possibly your madness. Run The Nasty and you become a real East Nasty. Considering the size of the groups which meet on Wednesdays you are sure to find a pace which will suit you. There are two primary units within each run, the Nasty Fasties and the Nasty Lasties–these names aren’t meant to delineate between “real” runners and posers, it is simply a uniquely East Nashville charm about the group. Outside of the Wednesday runs, there is a free half/full marathon training program (be sure to ask about it), and regular Saturday morning runs which are organized in partnership with the PR Bandits. The Facebook page for PR Bandits is often updated and serves as the best place to ask questions about upcoming Saturday excursions. These meets attract over 60 people on average and like the Wednesday runs with East Nasty, vary in pace. Often people will stay for breakfast post-run and this Saturday run serves as an excellent way to explore parts of Nashville you otherwise may not have taken the time to visit. Always fun to be had with the East Nasties! East Nasty doesn’t just host runs, the group also sponsors, volunteers and supports all types of running events and other groups which further the running community as a whole. The work they do is comprehensive and can be further researched here. The group also works with running brands which often attend the Wednesday evening run and show off product; the brands range from Brooks, Pearl Izumi to Saucony and more. Refer to the site in order to see if any events are going to be incorporated into the run as it may benefit you to show up early if possible. Be sure to check their site often for new runs and the current routes! With any questions or additions to this piece, post below. Run Nashville is a blog dedicated to the running community in the greater Nashville area. Here you'll find all local area races, run shops, products and local running routes.